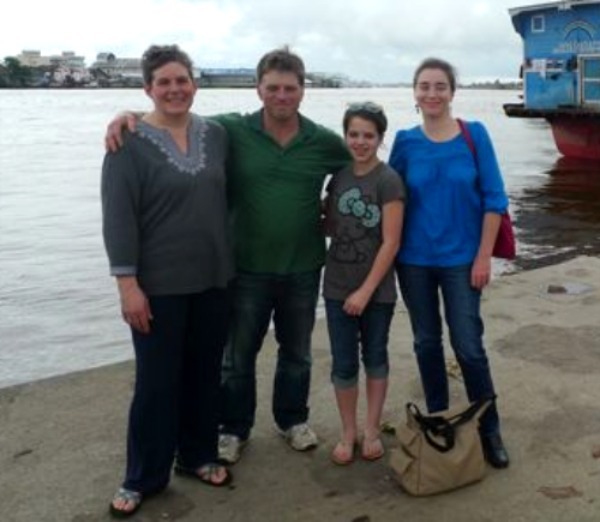 The Beidler Family [Beidler Family Farm] recently returned from a marvelous adventure in Indonesia. Besides growing organic wheat and milking cows in Randolph Vermont, Brent Beidler also serves on the Board of Health-in-Harmony, an organization making a difference in people’s lives in West Kalimantan, Indonesia. Regina shares with us about their experience. 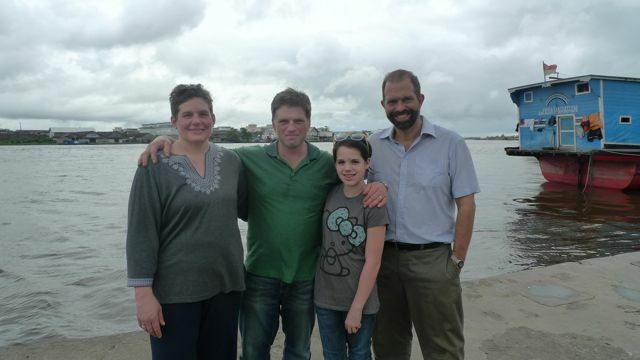 We were hosted by our friends Cam and Kinari Webb who made our time in Indonesia very memorable. Cam is a rain-forest ecologist who does research and also teaches field courses for students from Harvard. Kinari is the founder of Health in Harmony and is a doctor and visionary who oversees the work of HIH. They have been our friends for over 15 years and it was a pleasure to see their work first hand. Our minds are full of impressions and things we want to remember as we return home from Indonesia. Here is what we saw and did during our time in Borneo. Gunung Palung National Park – The work of Health in Harmony is focused on the villages that surround this 200,000-acre national rainforest park, which is home to 10% of the world’s remaining orangutans. This forest is the watershed for 60,000 people and is an important and challenged resource. Illegal logging is monitored in the park and although there are incentives to not log it continues unabated. We saw several factors that impacted the continued logging. West Kalimantan (regency or equivalent to our states) was recently divided in two with Sukadana (where clinic is located) as the new seat for one of those halves. This has created a bit of a building boom and, in the absence of Home Depot, wood is needed for building. Birds Nest Soup is a delicacy in Asia with premiums paid for the bird nests. Local folks have discovered that 3 story swallow houses can be constructed and insulated providing cool habitats for swallows that allow them to harvest the nests. People are paid $1500/kg which is huge money compared to what they earn in the local economy. These houses are mushrooming up everywhere and are taking building materials plus making an undetermined impact on the local swallow population. People continue to run into huge medical care bills for care at hospitals outside of the clinic. These bills are way out of whack with what people earn and what they can pay. For instance, one woman had some complications after a c- section that required her family to cut down 90 Durian trees (averaging 30-50 meters or 100-150 feet tall) to pay the bill. Trees are part of a family’s savings account and people often destitute themselves in order to pay for medical care. We heard from Cam that rainforest trees grow, on average, 2 mm per year. If you figure out the replacement time for first growth forest we are talking hundreds of years. Conservation efforts are happening but the impact will be long term rather than short term. We had the chance to go hiking in the forest one weekend. We traveled 45 minutes by motorbike to the trailhead and then had a two-hour hike up to a camping spot. The first third of the hike was moderate hiking and we were lucky to spot an orangutan high up in a tree- a rare spotting. The second third was up more steep terrain with some scrambling required. The final third was aided by knotted ropes that one could use to pull oneself up. We were glad to get to the top at dusk and spent the night in a treehouse listening to the night noises of the forest. We also saw red leaf monkeys, gibbons, a hornbill and lots of insects and plants that showcased the diversity of the forest. Coming down was much easier and we were able to admire the series of waterfalls that flanked the trail. The big question that underlies much of the rainforest conversation is the difference between our first world mentality about maintaining forests for future generations which is undergirded by our ability to financially meet obligations in other ways and the developing world thought of needing to meet family needs today and the opportunities that exist to benefit families in the present rather than unknown opportunities in the future. Health in Harmony – ASRI – The centerpiece of Health in Harmony is providing high quality, low cost health care to the people in the region with alternative means of payment available to all. Since its beginning in 2007, HIH has seen 17,000 patients for 25,000 patient visits. All of this in a very modest building with a very dedicated staff. Plans are underway to begin construction of the hospital, which is the next step. This will allow additional services to be provided long term at a local level and with better results than at the national health care service. Two cases we heard about the first day illustrate the success and continuing challenges faced by HIH. In one case a woman came in with very high blood pressure. She was quickly examined and by afternoon’s end had things well in hand. In the absence of HIH’s clinic she would not have had access to this easily managed issue. The same day a 22-year-old woman with three young children came in and was determined to have uterine cancer. The current facility has no ability to do endometrial biopsies (lab not available for testing) or to perform a hysterectomy. The woman currently has the choice to go to a national hospital but we were told care would probably run about $5000 – well beyond what she can afford. In effect, she has a death sentence because care is not available to her. When the hospital is complete this issue as well as many others can be dealt with locally and affordably. If anyone wants to make a big difference to the long-term health of the residents served by Health in Harmony money sent to the hospital fund raising campaign is a great idea. In spite of all of this we can say that the health care program at HIH is a raging success. Ancillary programs at HIH – A number of other programs compliment the mission of affordable health care and rainforest conservation. Organic Farm Training – The use of chemical fertilizers, pesticides and herbicides and slash and burn agricultural techniques were and continue to be quite common in Indonesia. HIH has done and continues to do organic farm training and the results are very encouraging. Most of the farm training relates to vegetable production and residents are not only seeing improvements in their soil but also are finding markets for additional vegetables to be very profitable even without a premium price. Goats for Widows – Widows were identified as a very vulnerable group and a program was instituted to give goats to widows. The first two kids and 5 bags of manure are returned to the program to be shared with other widows, which will ensure the program’s continuation. Most of Brent’s time and some of Regina’s was spent at trainings held for these widow groups to talk about what is going well and what challenges they are facing. The age of the widows ranges from very young to women in their 60’s. They were delightful and Brent found that many had found good solutions to issues and were willing to share with each other. The conversations were lively and as always, with animal husbandry, good nutrition, clean housing and access to shade and water go a long way in ensuring good health. We were able to visit a number of widows at their homes and they were happy to show us their animals and their areas. Scabies is the main health concern and Brent helped to access Ivermectin for the worst cases where animals were in danger of dying as well as starting some experiments with local leaves and remedies that could be advantageous in addressing scabies if caught early. The manure from these goats is an important element in compost and the organic farm training. Reforestation – There is a sobering PowerPoint slide that shows the massive deforestation of Borneo in the past 50 years from almost complete rainforest cover to almost none. One of the alternative methods of payment for health care is seedlings, which are then used for replanting areas that have been cleared. Unlike the states where trees grow back in areas that are untended an invasive grass comes in to dominate instead. This grass is not edible by animals unless grazed at a very tender stage so it takes over with no advantage to anyone. HIH has replanted 20 acres so far with 38,000 seedlings and will continue the intensive long term work of continuing to replant areas that have been cleared. We were lucky to be at a Green Day celebration at the current reforestation site about 2 hours from Sukadana where 200 local residents came out to plant that day and to celebrate the current work being done. Local buy in from communities is essential to the continued success of reforestation. The end of many days brought a swim in the South China Sea – a 10-minute walk from Cam and Kinari’s house. The water was perfect bathtub temperature and after hot and humid days was a refreshing way to end the day. The last evening Cam took us out in their dugout canoe. It was an interesting experience – tippier than a Western canoe and low in the water with 4 of us in it. Another interesting way to see the islands just off of Sukadana. Cam and Kinari’s house has been made very comfortable. Rural Indonesia has electrification and although power outages are common most of the time there are lights and fans to keep one comfortable. We have photos of their house and bathroom facilities if anyone is REALLY interested in those. The people of Indonesia are warm and welcoming. We were treated with great kindness and will always remember the people. Days started at 4 am with the calls to prayer (multiple mosques in town) and had a rhythm that was very fluid and warm. Our last two days we spent in Singapore which we appreciated on a basic level for regular bathrooms, hot showers and air conditioning. We have to say that it is an AMAZING city, spotless, high tech and manicured to an inch of its life. It has the highest per capita income in the world and you can tell. We spent one day at the Singapore Zoo, which is unparalleled. Many animals are minimally contained so one can literally almost reach out and touch the animals. The orangutan exhibit in the middle of the zoo allows the orangutans to traverse the area by climbing along vines and nets above your head as you watch. Health in Harmony is working in cooperation with a comic book that talks about deforestation and the impacts on environment and health. Sales of this will benefit HIH’s work.